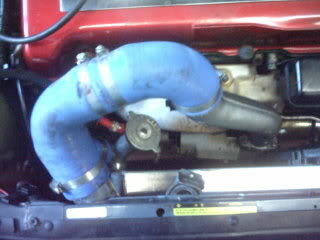 Yea I see what you're saying, the pipe into the plenum could easily be one piece and smooth mandrel bends! @DC313 wrote: Yea I guess they are still a fair bit of dollar! = 12 litres capacity required and 200cm^2 X-section. using a standard PWR core depth of 68mm it would need to be 600mm wide and 300mm high. least then I can have the pipe work the diameter I want and in the best position for shortest runs. 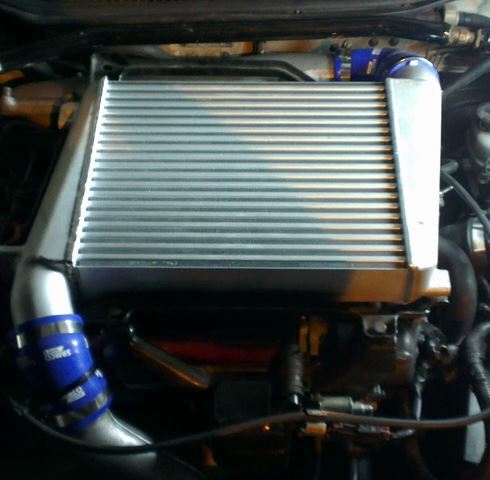 Have a Malaysian R here I been on track with & he runs a close 400hp on recored top mount with improvements to heat shielding, baffle for air flow & water injection & cool intake temps . I'll pm you a number I had for guy in uk who did couple of recores a year or so ago. Same with the turbo to cooler, easily put right but at 800 plus uk vat I would expect it right to start with, was good effort but still little bit sloppy & not what you expect from pro fabricators/engineers. done a good effort on core & rad as it big core & retains bumper uncut. I would buy the cooler/rad but tell um either do pipes proper or knock off £250 (+20%vat ) & you'd do them yourself proper . pretty easy work out size/shape for rad/cooler & get decent fabricator knock it up & then work out final pipe routes nicely in a trial build up, would be cheaper & better end result with bit of time, effort & patience . Man the pipe work is super short with that set up. Looks good to. Well i have a forge and all this talk of short pipe runs i decided to go back to a topmount and i noticed no difference. 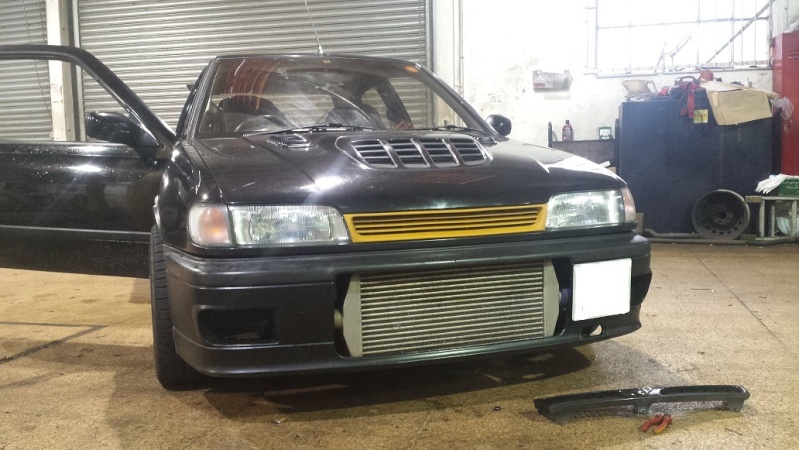 So i've bought another evo intercooler and i've brought the slam panel support out further and using the forge pipe run. It not so much about short pipe runs but more important is minimising joins & bends best as possible & direct run over top of radiator similar to radtec is about best way achieve that for front mount. Point with top mount is it more capable than the tuning tales suggest . If inlet temps go up when using a longer pipe run than a shorter pipe run then i can see the benefit but if not and as i noticed no difference between tmic, fmic it doesn't really matter does it? Does that become a catch 22 then with pipe temps? 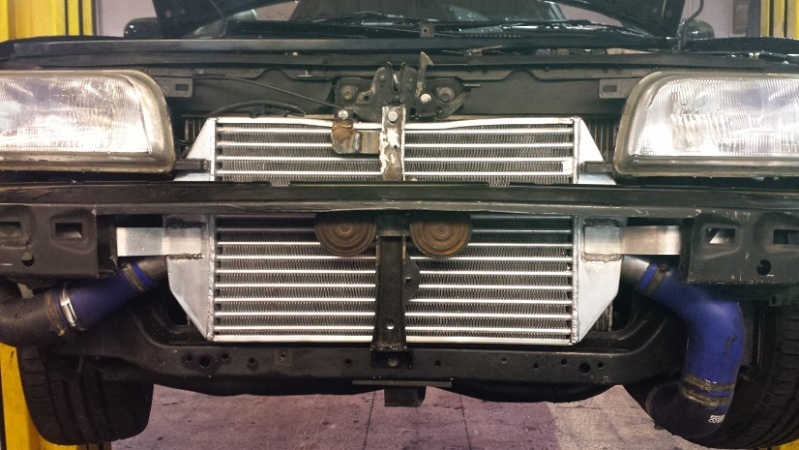 Here's my effort i've been working on as i couldn't stand the fmic look and it was very cheap to do. Just some cheap evo IC that i had tabs welded on and recycled the forge IC piping. Waiting for another bumper iron to come then i can secure the IC to it and have some shorter pipe work coming and paint the support bar. Would it of been easier to have the pipes going upwards and come either side of the rad ??? This is what I'm planning to do although I want to run pipes bit differently (there is some cutting involved) can you tell me how thick is your core mate?? 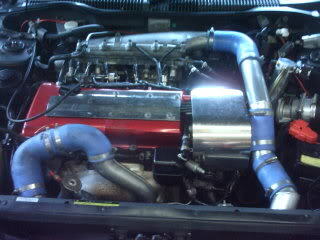 @nomad wrote: Would it of been easier to have the pipes going upwards and come either side of the rad ??? 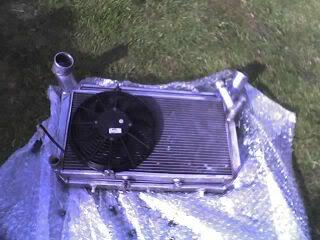 I thought about that and it would be a smaller radiator probably custom. tbh its a low cost job, not much money spent. Its this IC but only annoying thing is theres holes for tabs on the other side that sit proud and they go all the way through. I just ground them flat and had them welded up and 6mm aluminium tabs welded on. Theres a threaded tab at the top that hits the lock so i ground that off. @mc_hawkings24 wrote: Its this IC but only annoying thing is theres holes for tabs on the other side that sit proud and they go all the way through. I just ground them flat and had them welded up and 6mm aluminium tabs welded on. Theres a threaded tab at the top that hits the lock so i ground that off. I think it's same thing what I've got. I'm cutting rad surround to fit though an I'll run my pipes through there, but I'm also thinking to cut cross member/rad support and weld in something like thick wall box section to lower it little bit. 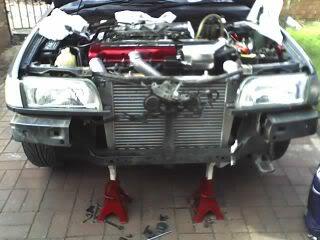 Any way did you ended up not cutting your bumper or did you have to trim it?? I thought you might slice the sides, i thought about doing it but decided to keep it original. No slicing of the bumper though got a good bit of room behind there now. 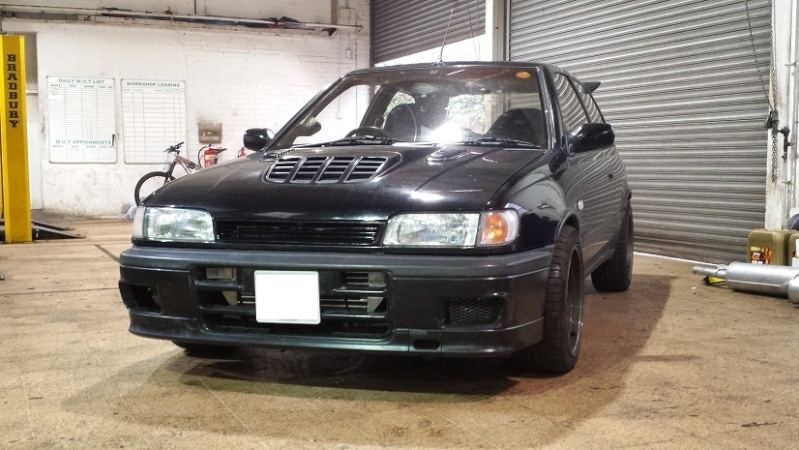 I was looking at the mishimoto universal intercoolers, not sure how they compare to others but they look like a decent bit of kit and they make decent rad so I'd of thought it would ok.